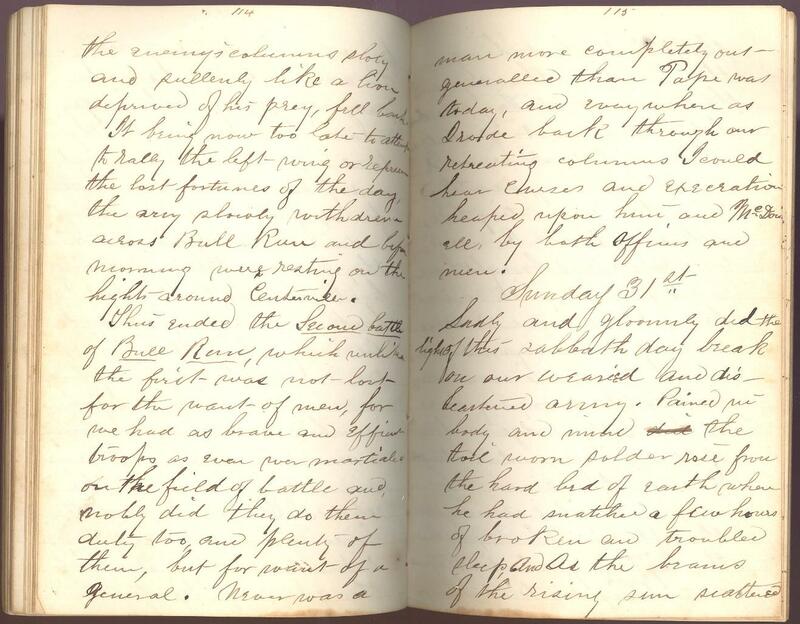 Item description: Entry, dated 31 August 1862, from the diary of William Penn Lloyd (1837-1911) of Lisbon, Pa., 1st Lieutenant, A.A.G., First Regiment Pennsylvania Reserve Calvary during the Civil War. 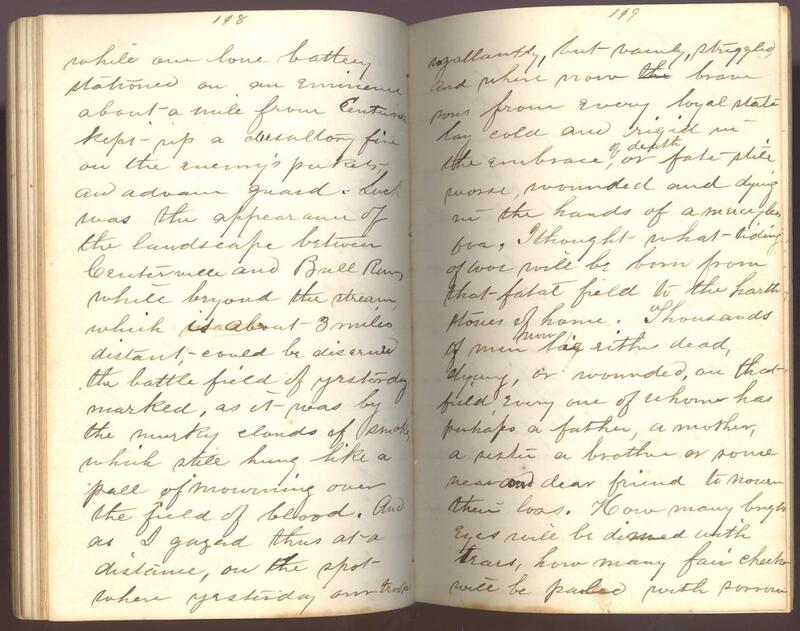 In this entry, a continuation of his 29 August and 30 August entries, Lloyd reports on the condition of the Union forces following their defeat at the Second Battle of Bull Run (Second Battle of Manassas), fought in Prince William County, Va., 28-30 August 1862. 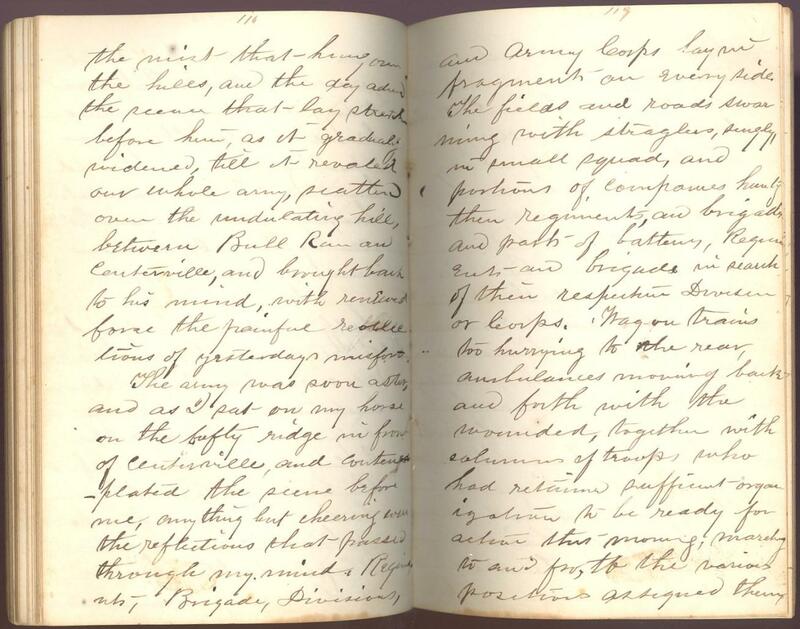 Item citation: From the William Penn Lloyd Diary and Notebooks, #3130, Southern Historical Collection, The Wilson Library, University of North Carolina at Chapel Hill. Sadly and gloomily did the light of this sabbath day break on our wearied and disheartened army. Pained in body and mind the toil worn soldier rose from the hard bed of earth when he had snatched a few hours of broken and troubled sleep, and as the [beams?] of the rising sun scattered the mist that hung over the hills, and the day [?] the scene that lay stretched before him, as it gradually widened, till it revealed our whole army, scattered over the undulating hill, between Bull Run and Centerville, and brought back to his mind, with [?] force the painful [?] of yesterday’s misfort. The army was soon astir, and as I sat on my horse on the lofty ridge in front of Centerville, and contemplated the scene before me, anything but cheering were the reflections that passed through my mind. Regiments, Brigades, Divisions, and Army Corps lay in fragments on every side. The fields and roads swarming with straglers, singly, in small squad, and portions of companies hunting their regiments, and brigades and parts of batteries, Regiments and brigades in search of their respective Divisions or Corps. Wagon trains too hurrying to the rear, ambulances moving back and forth with the wounded, together with columns of troops, who had retained sufficient organization to be ready for action this morning, marching to and fro, to the various positions assigned them while our lone battery stationed on an eminence about a mile from Centerville kept up a desultory fire on the enemy’s pickets, and advance guard. Such was the appearance of the landscape between Centerville and Bull Run, while beyond the stream which is about 3 miles distant, could be discerned the battlefield of yesterday marked, as it was by the murky clouds of smoke, which still hung like a pall of mourning over the field of blood. And as I gazed thus at a distance, on the spot where yesterday our troops so gallantly, but vainly, struggled, and where now the brave sons from every loyal state lay cold and rigid in the embrace of death, or fate still worse, wounded and dying in the hands of a mercyless foe, I thought what tiding of woe will be born from that fatal field to the harth stones of home. Thousands of men now lie either dead, dying, or wounded, on that field every one of whom has perhaps a father, a mother, a sister a brother or some near and dear friend to mourn their loss. How many bright eyes will be dimmed with tears, how many fair cheeks will be paled with sorrow, and how many gay and happy hearts will be [?] and torn with anguish, when the sad news reaches hundreds of homes that a father a son, a husband or a brother, their loved one whose image is enshrined in the hearts most sacred affections, had fallen, that some deadly [?] had snapped the cords of life, the good and loving spirit had taken its everlasting flight, and the form endeared by the tenderest recollections left in the hands of an inhuman and unprincipled enemy. The day was spent in collecting and condensing our forces along the hights around Centerville and moving the baggage train to the rear and passed off without any fighting. Should the enemy have attacked us here we would have had every advantage of position but it is hard to say how our troops might have acted in their present dispirited condition; at least our commanders have strength at least to act entirely on the defensive, and await our attack rather than make one. 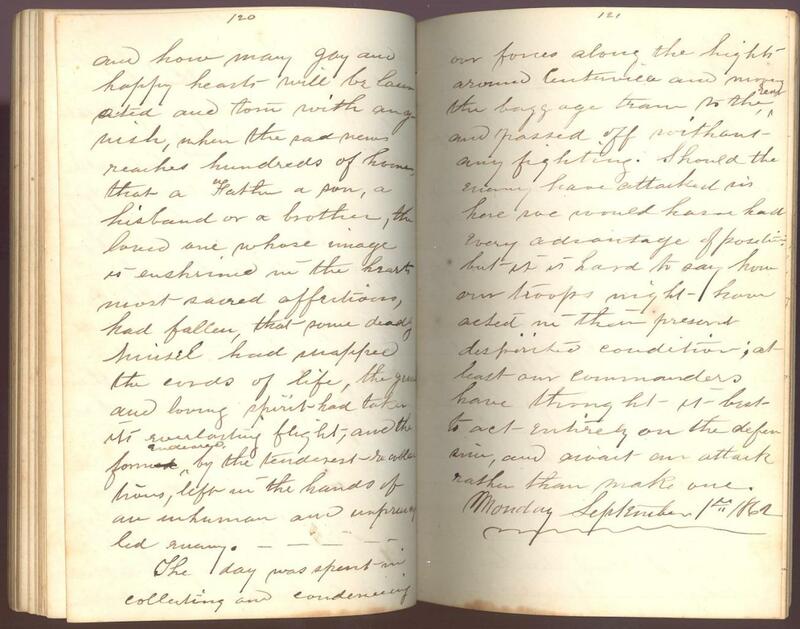 This entry was posted in Southern Historical Collection and tagged 1st Pennsylvania Reserve Cavalry, Centerville, Pennsylvania, Second Battle of Bull Run, Second Battle of Manassas, Virginia, William Penn Lloyd. Bookmark the permalink.